Actress/Singer group, Bump.y released their latest single on August 10th titled Kiss with a cute, airy summer vibe that rivals 9nine's own airy, summery PV, Natsu Wanna Say Love U. 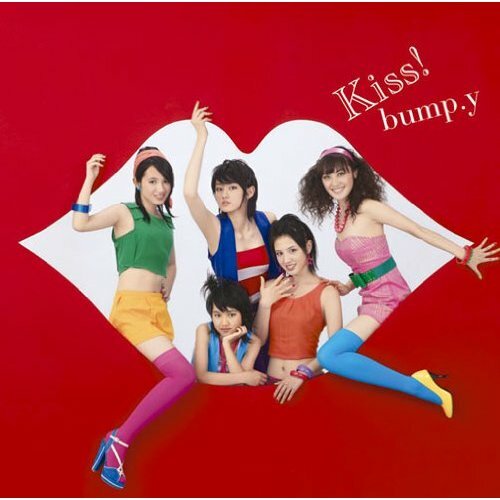 With a K-pop influenced theme (dance and PV wise), Bump.y show their hopes and dreams of a first kiss experience for the summer. Bump.y are a group who I have very recently started following this year, and was one of the groups that broke my Hello! Project only Love - This group is honestly one of the best, in my opinion, beating out other big groups which have recently come onto the scene such as PASSPO and Berryz Kobou. It is probably because they are a 5nin group that I love them, or maybe it is just the whole concept of Bump.y - Actresses who are also singers (yes, this falls into the Idol genre, but their main purpose was to be actresses who are also singers) - but even if it was just that, you can not deny that their songs are catchy and overall very nice to listen to - and Kiss! is no exception. When I first heard this song and watched the PV, I honestly don't know what went through my head other than 'this is cute'. I then went on to post on a forum I frequently visit, and the other members went on to say how it reminded them of 9nine's own summer PV, Natsu Wanna Say Love U, another Kpop-influenced summer PV. The only difference is that Bump.y's song is much more toned down than that of 9nine's, awith a much simpler PV concept that still retains a refreshing image without too much going on in the background or too much colour to overwhelm and take over. A few have commented on how this song sounds 'Quite 80's' and when listening to it, I can definitely hear the 80's pop influence coming from it, but even with that 80's spark added to it, the song still gives off a great 'relaxing' vibe whilst still maintaining its up-beat, summery tune that is cute and refreshing to listen to when you have so many up-beat and lively songs such as Momoiro Sparkling, Natsu Wanna Say Love U and Pareo wa Emerald and many other popular summer songs. Moving onto the music video, Kiss! is both a colourful and calming affair. With two different backdrops during the dance, we get a plain, light jigsaw backdrop and then opposing it, a colourful and decorative jigsaw background. With the plain backdrop, the girls are definitely eye catching in their cute, candy-striped red and white shirts and their bright red shorts, whilst during the colourful backdrop, they sport their candy-stripe costumes, cute and summer inspired outfits and then fun, bright clothes that bring a great pop of colour to this PV. For their dance, it is a simple and cute K-pop inspired number which will be quite easy to learn, but it fits the song perfectly. The scenes where the girls change from the candy-striped clothes to their summer-themed wear and then to that 80's inspired pop of colour is a nice way to add colour to the scenes of the video. With a song like this, I don't think that the dance should be too complex, so the dance they have suits the theme of 'A First Kiss' and a refreshing summer. Though the PV itself isn't overly complex, it still creates a cute summer vibe. With simple backdrops and simple close up shots, there really is no story, but it emanates each of the girls well and shows their cute and beautiful sides as they dance and sing to the song. An uplifting song that is calm, New Day makes me think about future days and hope for them to be as bright and cheerful as this song makes me feel. I don't know why, but something about this song makes me feel somewhat nostalgic, like I should look back into my past and then head forward to a brand new day. Overall, both of these songs are a treat to listen to and make me feel much happier and also at ease. Whilst Kiss! is a great deal more summery than New Day, both of these songs suit each other perfectly. They are both relaxing songs with an up-beat chorus that reminds me of a K-pop song. And there is a reason behind that! Kiss! was produced by Sweetune, a Kpop composing duo who have written for Kara (they produced Honey) and the PV and dancing was also produced by them, giving Bump.y a K-pop feel in a J-pop song. So, do I think that Bump.y were successful in producing a K-pop feel to their song and video? In my opinion, yes I do. Though their song or dance don't have much of the K-pop edge that 9nine's Natsu Wanna Say Love U did, I do feel that Bump.y presented it better and showed the more relaxing side a K-pop influenced summer song with their own cute J-pop flare to create a great music video and a beautiful song which I will certainly listen to more than once or twice. So is this single worth buying? I would say yes - I would probably choose it over Morning Musume's ONLY YOU if I hadn't bought it already! Through the simple background, the cute clothes and the hopeful lyrics, I have fallen in love with Kiss! and its coupling song New Day, and even if I do really like the music video as well, the songs definitely beat it, so I would buy either the regular edition or the Limited A or B side if I could! Overall, I really do recommend that you give these two songs a listen to. They are a big step-back from the songs I usually listen to (Hello! Project, those crack-induced songs!) about summer, but as I have said a few times, these sort of songs are extremely refreshing and welcoming to my summer collection of favourite J-pop songs. It just shows that great summer songs come in all sorts of packages, and from the package that Bump.y have delivered to us, it is a great one, and it definitely beats some summer tunes that I have been dedicated to for a while now. So go check these songs out! In response to the Intl Wota post, I actually am more of a C-ute fan than a Berryz fan, so for me to make a comparison to Bump.y over Berryz is just my way of thinking, because I don't really care for the group - they have great songs, don't get me wrong, but I find more of their songs less memorable than others. But I thank you for considering my post and taking time to write your very own thoughts on it! It makes me happy that I gave you even a little interest in this group that I like to listen to. I may not be clear all the time - I find I have a hard time phrasing things (nooo ;w;). And about Matsuri (the youngest member) not being the 'hawtest' - that made me giggle - she is only 12, give her time to grow into her looks ;) not all idols are born absolutely perfect or breath-taking, and she is a decent singer and dancer, so for now looks aren't the priority (okay it is for some, but for me, not so much) but she may grow into them. Look at how Chisato turned out to be! And people didn't think she was the prettiest C-ute member - good singer, but she wasn't the prettiest.